You are here: Home / Travel / Is 1 Day Round Trip to Isla Mujeres By Bus from Puerto Aventuras Possible? 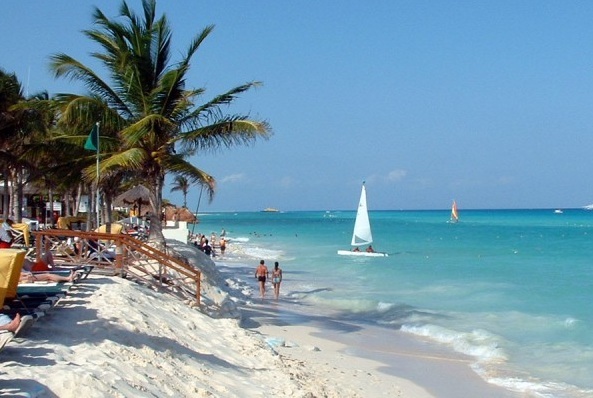 Is 1 Day Round Trip to Isla Mujeres By Bus from Puerto Aventuras Possible? Recently someone posted a question on Tripadvisor asking if it is convenient to go to Isla Mujeres by bus from Puerto Aventuras for a day trip? What will be the journey time and also if it is important to return before it gets dark? A same day round trip from Puerto Aventuras (Check Puerto Aventuras listings) to Isla Mujeres by bus is doable for sure, but could get slightly tiring. Get on the bus that stops over in Puerto Aventuras and then takes you to Playa del Carmen or Cancun, but with frequent stops all along the way. Journey time will be approximately 2 hours. Once at the Cancun bus terminal, a taxi will be your quickest way to the ferry. Depending one what activities you would like to do in Isla, it should not be a problem getting to Isla and back before sundown. If your budget allows (USD 150 for round trip), taking a taxi will be the easiest and fastest way to the ferry terminal. Reverse these steps for your return journey from the ferry. We suggest you begin your trip at dawn and catch the first bus to Cancun. If you’re on Isla Mujeres visiting Turtugranja is a MUST!